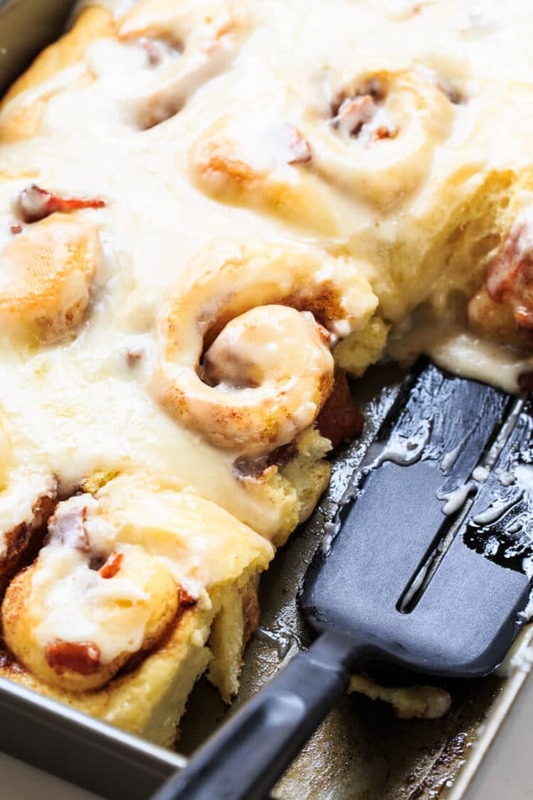 Bacon Cinnamon Rolls have that incredible pairing of sweet and salty. Finely chopped bacon gets mixed with brown sugar, cinnamon, and butter, and rolled up in a soft and pillowy cinnamon roll dough. 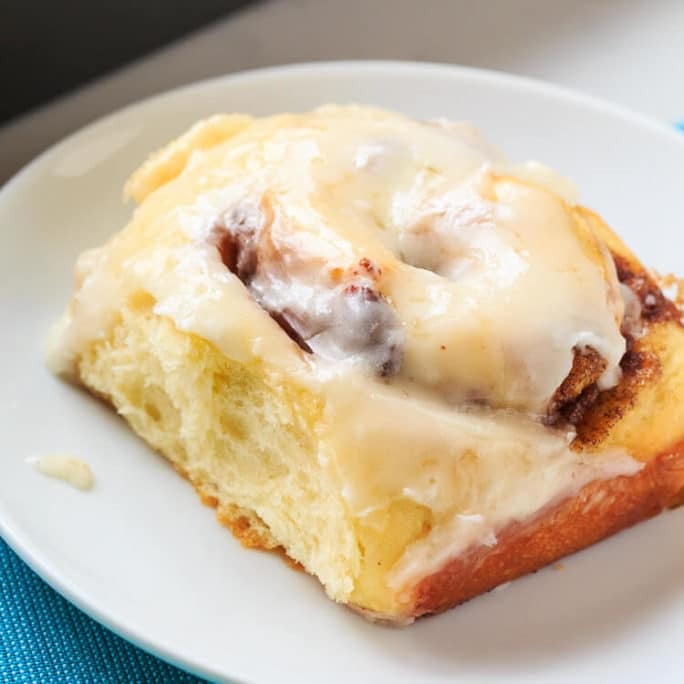 Each and every bite has that smokey bacon flavor and plenty of sweetness and cinnamon flavor. And if these Bacon Cinnamon Rolls weren’t already decadent enough, I added a thick, sugary glaze flavored with a little maple syrup. 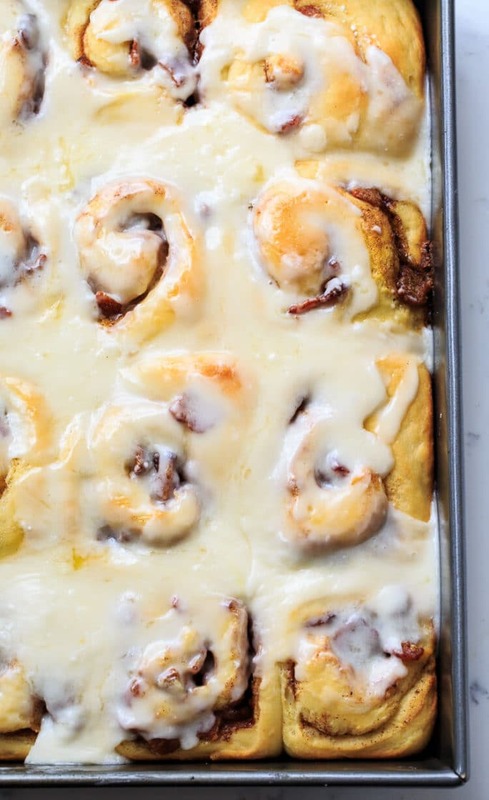 Bacon Cinnamon Rolls are just the thing when something self-indulgent is in order. Tip: Feel like your house isn’t warm enough for dough to rise? If you have one of those portable electric heaters, put it in the smallest room in your house, turn it on and close the door. I put mine in the laundry room plus I try to time a load of laundry at the same time. Between the heater and the dryer being on, my dough rises in no time. 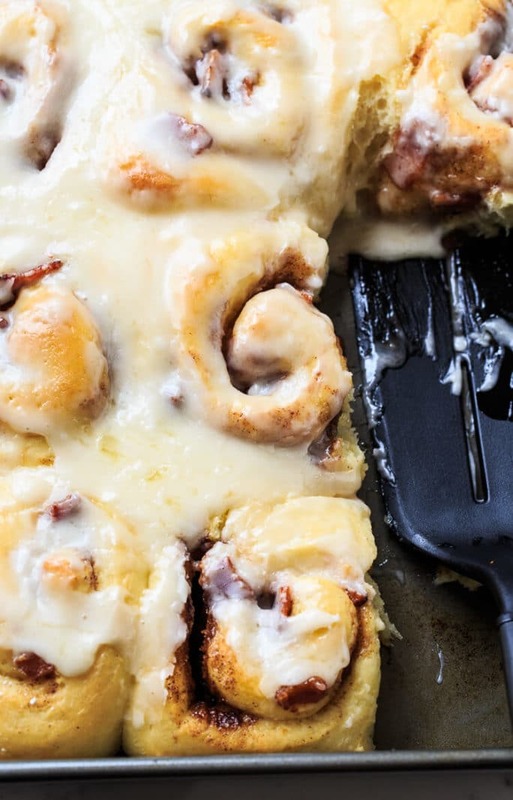 Bacon Cinnamon Rolls have that winning salty-sweet combination. Lots of chopped bacon along with cinnamon and sugar is wrapped up in these soft, delicious rolls. In a small bowl, dissolve yeast and 1 tablespoon sugar in warm water. Let sit 5 minutes. With an electric mixer, beat milk and pudding mix for 1 minute. Let sit 1 minute or until soft set. To pudding mix, add egg, melted butter, salt, yeast mixture, and 2 cups flour. Beat on medium until smooth. While dough rises, make filling. Cook bacon in a skillet until crisp. Remove with a slotted spoon and drain on paper towels. In a medium bowl, stir together brown sugar, cinnamon, 1 tablespoon maple syrup, 1 tablespoon melted butter, and 2 tablespoons of bacon grease. Stir in bacon. Roll dough out on a lightly floured surface into a 18x10-inch rectangles. Spread filling to within 1/2 inch of edges. Roll up jelly roll-style starting at a long end. Cut into 12 slices. Place rolls in a greased 9x13-inch pan. Cover with a towel and let rise until doubled in bulk, about 45 minutes. Bake rolls for 20 to 25 minutes. Make icing. Whisk together confectioners' sugar, butter, milk, and maple syrup until smooth. Spread onto still warm rolls. The little bits of bacon are so good! The filling with bacon is so good! They are so good Mary! Hope you get to try them!